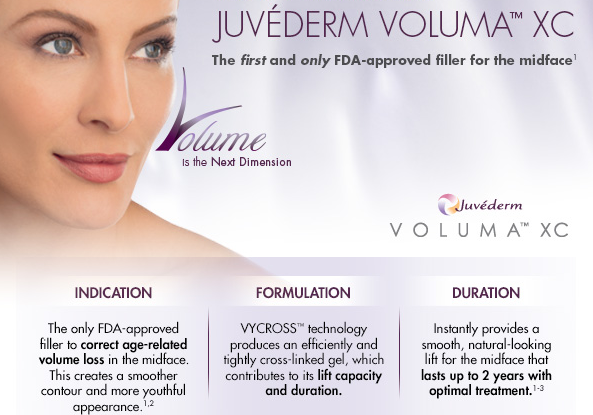 Juvederm Voluma is a hyaluronic acid facial filler specifically made to restore age-related volume loss in the mid-face (the cheeks, cheekbones and around the chin). Voluma uses hyaluronic acid, a sugar that occurs naturally in your skin, to instantly restore lost facial volume. It gives a subtle, re-contouring lift that can last 18 to 24 months. Voluma also combines with collagen and elastin to improve skin structure and elasticity, and create a smooth natural look. The results are instant and natural looking.